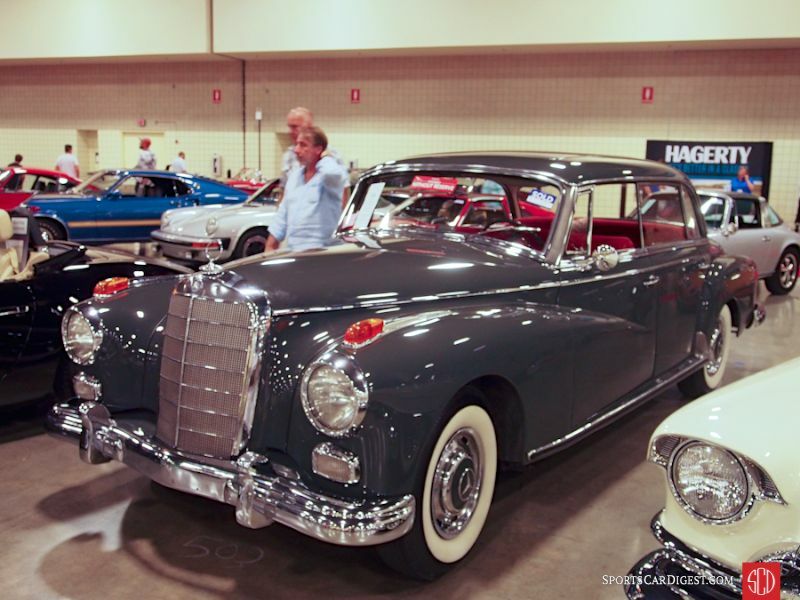 Lot # 526 1960 Mercedes-Benz 300d 4-Dr. Hardtop; S/N 18901110001967; Dark Grey/Red velour; Estimate $50,000 – $65,000; Unrestored original, 3 condition; No Reserve; Hammered Sold at $41,000 plus commission of 10.00%; Final Price $45,100 – 4-speed, Becker Mexico radio, split front seats, body color accented wheel covers, whitewall Silvertown tires, sliding sunroof. – Fair old paint, worn interior, cracked varnish on the interior wood, erratic chrome. All there, an honest, solid, dry, well preserved car with a single owner since the early 90’s. – Fairly nasty, but with plenty of potential, albeit realized at great cost, this ‘Adenauer’ still has class and distinction. Similarly nasty Rolls-Royces of the period sell for more and are destined to sit outside mediocre restaurants trying to impart class to their over-priced menus. This is a better automobile and can still be driven with some pride, particularly at this price. 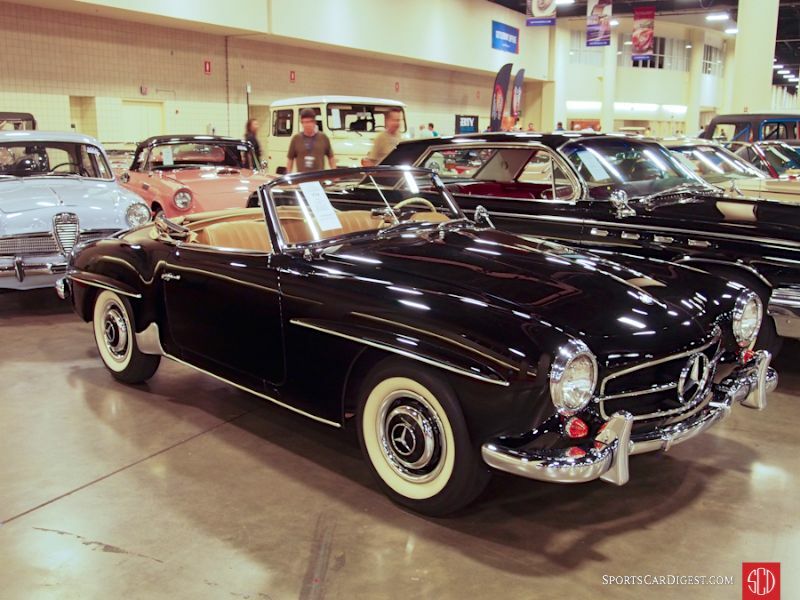 Lot # 719 1959 Mercedes-Benz 190SL Roadster; S/N 9500074; Black/Tan leather; Beige cloth top; Estimate $100,000 – $130,000; Cosmetic restoration, 3+ condition; With Reserve; Hammered Sold at $94,500 plus commission of 10.00%; Final Price $103,950 – Hubcaps, trim rings, whitewalls, no radio. – Weber carbs. Good repaint, chrome, older interior and top soiled over the bows. One touched up chip on top of the left front fender. Engine and underbody are older and grimy from use. – This car was sold by Christie’s from Bill Lassiter’s collection in 1999 for $27,600 in much the same condition as it is in today but now having a replaced interior now attractively worn in. It is a sound and usable car bought for an appropriate price in the declining 190SL market. 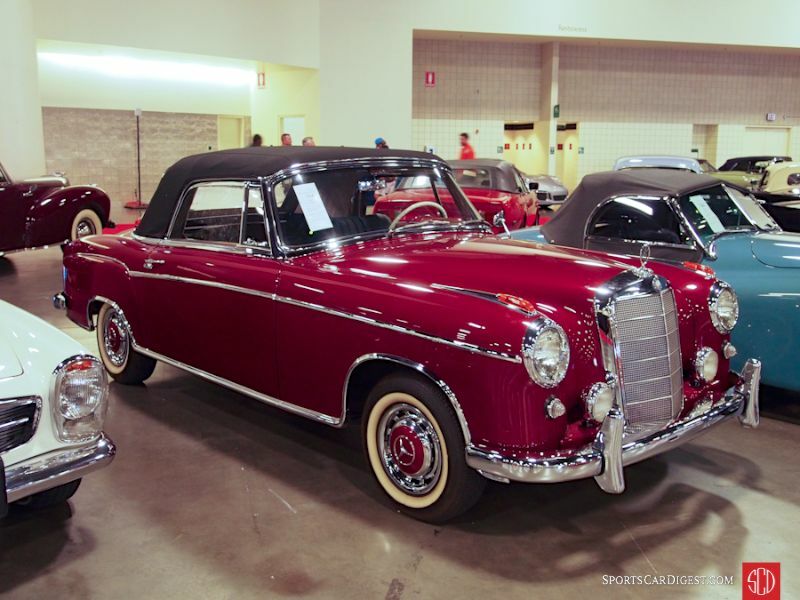 Lot # 724 1960 Mercedes-Benz 220SE Cabriolet; S/N 12803010003229; Burgundy/Black leather; Black cloth top; Estimate $110,000 – $120,000; Older restoration, 2 condition; With Reserve; Hammered Sold at $100,000 plus commission of 10.00%; Final Price $110,000 – Becker Mexico radio, 4-speed, Hella fog lights, body color accented hubcaps, whitewalls. – Very good, paint, chrome, upholstery, top and interior wood. Exterior color overspray inside the wheelwells. Well restored with some subsequent use and quality upkeep keeping it in credible condition. – A very good example with a restoration that is holding up very well. The result is in line with the pre-sale estimate but could have been significantly more without being expensive, it’s that good a car. Lot # 728 1971 Mercedes-Benz 280SL Roadster; S/N 11304412023673; Ivory, Ivory hardtop/Dark Blue leather; Estimate $75,000 – $85,000; Visually maintained, largely original, 3+ condition; With Reserve; Hammered Sold at $72,000 plus commission of 10.00%; Final Price $79,200 – 5-speed, Becker Mexico cassette stereo, aftermarket leather rim steering wheel, body color accent wheel covers, Euro headlights, Pagoda hardtop and soft top, Frigiking air conditioning with a rotary compressor. – Top of the engine is cleaned up for the auction but the rest of the grimy bits are grimy. Sound repaint, original chrome and redone interior. A driver quality SL that shows reassuring care but far from the best out there. – The desirable and rarely seen 5-speed works wonders to take full advantage of the 280SL’s 180hp. Neither the 5-speed nor the A/C are factored into this price, which could have been well into the pre-sale estimate without being expensive. 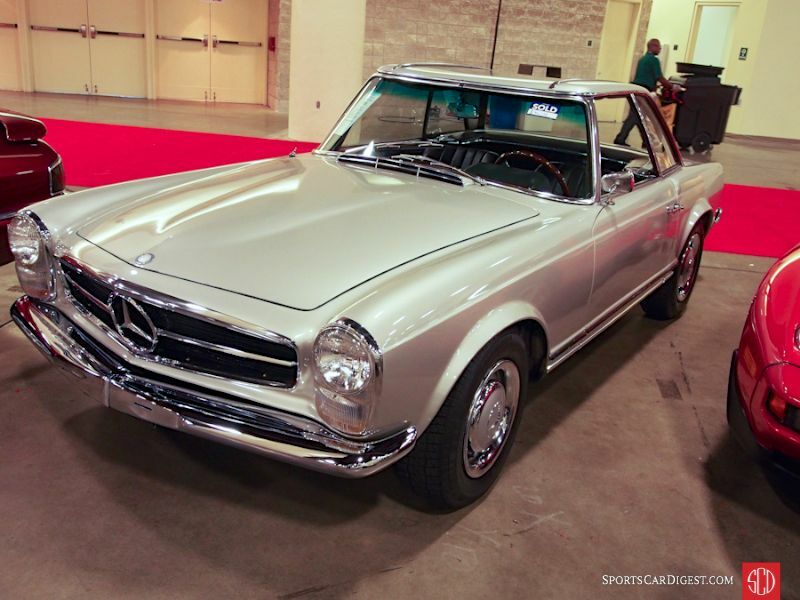 Lot # 731 1967 Mercedes-Benz 230SL Roadster; S/N 11304212019539; Silver-Grey, Silver-Grey hardtop/Black leatherette; Estimate $45,000 – $55,000; Visually maintained, largely original, 3- condition; With Reserve; Hammered Sold at $42,500 plus commission of 10.00%; Final Price $46,750 – Automatic, hubcaps, trim rings, Pirelli P300 tires, Clarion cassette stereo, two tops, Nardi woodrim steering wheel. – Fair older repaint with a few flaws, dust motes and cracking corners. Weak chrome on the hardtop and window sills, sound major chrome. Paint chip on the right rear corner. Pitted interior top brackets. Good upholstery and carpets. Dirty original underbody. Cosmetically maintained to mediocre standards in driver condition. 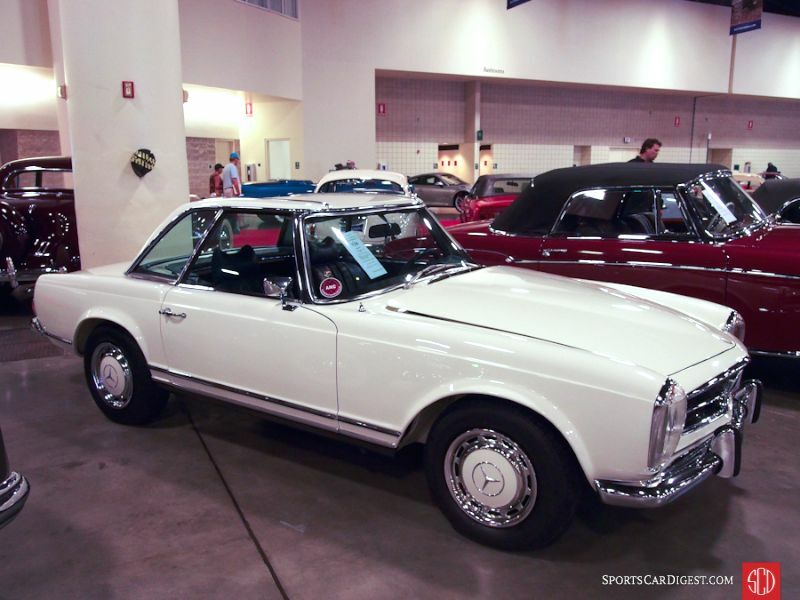 – This is a pretty tired 230SL, but it is well equipped including both tops and could have brought another $5-7,000 without being excessive. 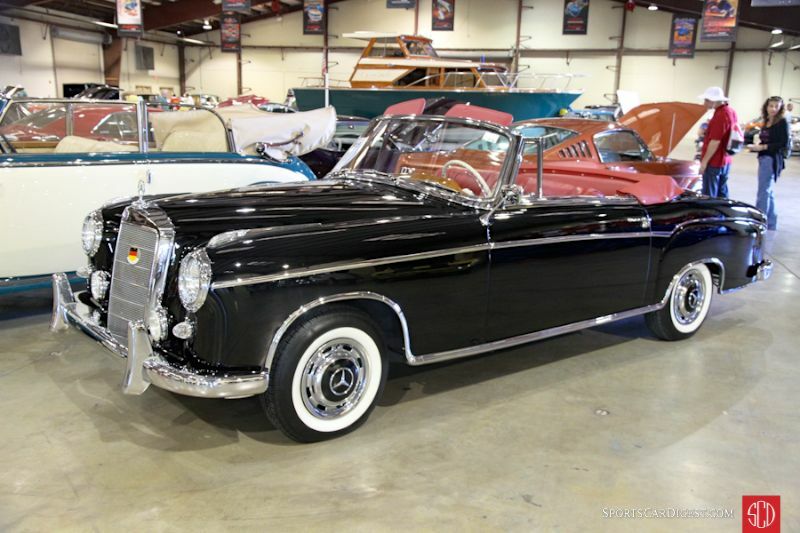 Lot # 415 1959 Mercedes-Benz 220SE Cabriolet; S/N 12803010950977; Black/Red leather; Black top; Older restoration, 2 condition; Hammered Sold at $200,000 plus commission of 10.00%; Final Price $220,000. With Reserve. – Wheel covers, whitewalls, Hella driving lights, red leather boot cover, Column shift, VDO dash clock, wood dash and door trim. – One of 1,112 built. Fully restored in 2002. Represented as numbers matching. Very good older paint and chrome. Rocker trim isn’t flush. Excellent interior. Very clean, lightly run in engine bay. An older high quality restoration that’s holding up well and only showing a few signs of general age. – This is a strong result for a $100,000 car. 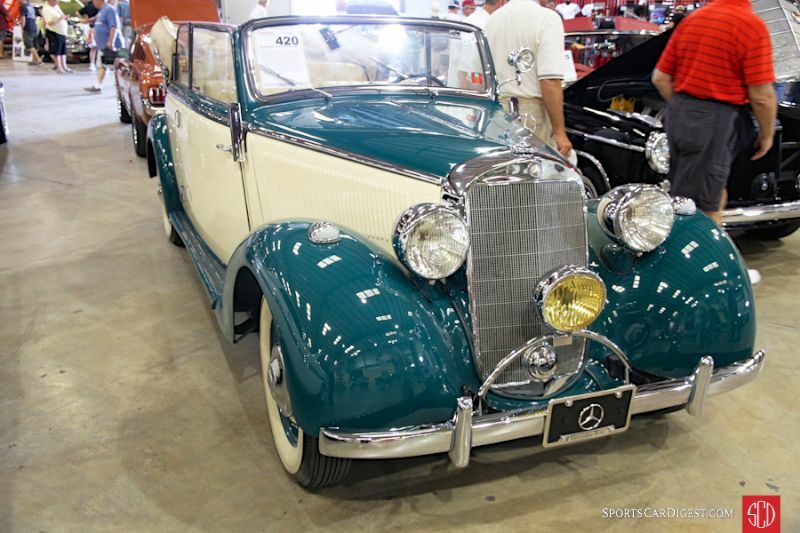 Lot # 420 1940 Mercedes-Benz 230B Cabriolet; S/N 446561; White, Green/Beige leather; Beige cloth top; Older restoration, 2- condition; Hammered Sold at $132,000 plus commission of 10.00%; Final Price $145,200. No Reserve. – White steel wheels with hub caps and green trim rings, Silvertown wide whitewalls, Bosch headlamps, central Amber driving light, single spotlight, trafficators, suicide doors, tan cloth boot cover, floor shift. – First registered in Switzerland. Full ownership history. Restored from 2006 to 2009. Comes with original luggage. Dirty tires. Decent but not great repaint. Very good and clean engine bay and underbody. Very good interior. Dull original steering wheel. An attractive classic cruiser in eye-catching colors. It’s not an immaculate restoration, though, and 10 years after the work was done you couldn’t call it much better than a very pretty driver. – It’s the M-B star on the front of this boring, underpowered Mannheim Benz that makes its reputation and its value. 55hp is not a lot, but a burger or gauleiter would have been gratified to have such a ride in 1940. Today, not so much, and the seller should be gratified to get this much for a usable but not attractive relic. 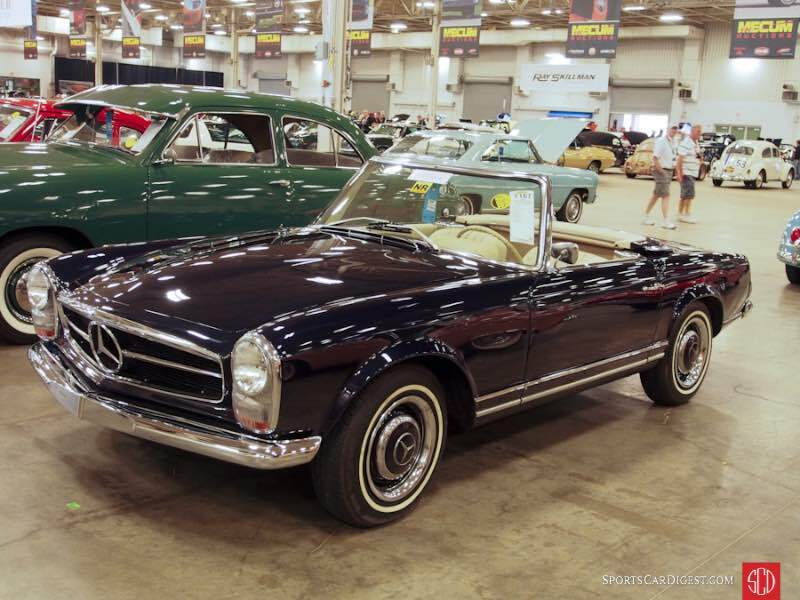 Lot # T167 1966 Mercedes-Benz 230SL Convertible; S/N 12013769; Dark Blue/Beige vinyl; Dark Blue top; Visually maintained, largely original, 3 condition; No Reserve; Hammered Sold at $54,000 plus commission of 10.00%; Final Price $59,400 – Automatic, hubcaps, trim rings, narrow whitewalls, Learjet 8-track stereo. – Chipped old repaint. Good major chrome and most trim except around the top boot cover and taillights. Interior has been replaced and is vinyl, not the leather claimed by the car card. Underbody is original, as is the dashboard. Cracked steering wheel spokes. Missing its radio tuning knob. – This isn’t the best 230SL, but it’s good enough at this price and has strong potential.